Eggless Banana Pancake - have been part of our lives for a very long time. This is a very soft and delicious Banana Pancake Recipe preparing at home By using banana, wheat flour, powder jaggery and fennel seeds, this breakfast recipe not only fills your stomach but also fills your soul and also a healthy cake with amazing taste. 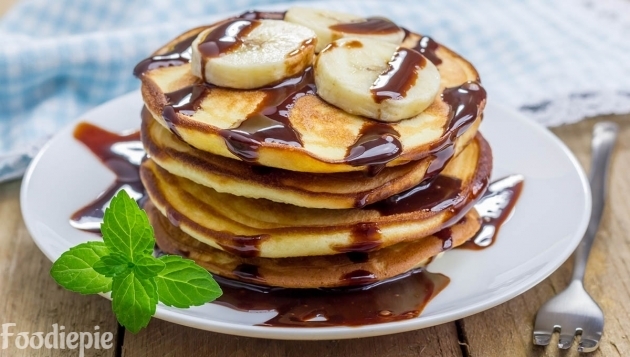 Eggless Banana Pancake is United States cuisine To make it easy and quite Simple, this vegetarian recipe can be delighted at such occasions as kitty parties, sports, picnics or buffets, and will leave everyone more crazy. Serve it with fresh cut seasonal fruits, along with fluffy cream or Chocolate syrup.Now Let's checkout recipe first. Step 1 : For making banana cake, take out the flour in a big bowl, add wheat flour, jaggery powder, salt, cardamom powder and baking powder and mix all the things well. Step 4 : Now Add 2 tablespoon ghee to the batter and mix it. The batter is ready, keep it for 15 minutes. Step 5 : Place the nonstick tawa or pan on the gas to make a pan cake, heat it and add a little ghee on the pan and spread it all around. Step 6 : Keep flame medium When pan is ready then take some batter and put it on the hotter pan. Once this bubble, flip it, and cook on the other side. To do this, until the edges of the pancake are crisp, and until turns golden brown in color. prepare all pancakes like that.Transfer to serving plate when all cakes cooked. Step 8 : Now take out from microwave and stirring well and again place in microwave for 30/35 seconds. Finally : Soft Delicious Eggless Banana Pancake is ready drizzle melted chocolate and honey on Pancakes and serve with tea or coffee.Serve your kids with cup of milk.